Laboratory science and classroom observation reveal four simple strategies that can promote learning. Because learning is an incredibly complex behavior, the science of learning includes many topics: how we learn and remember information in school, how we learn from the environment around us, how our actions influence what we remember, and so on. With this in mind, it’s useful to think of learning science as an umbrella term that spans many research fields including psychology, computer science, and neuroscience. Our own research sits in the field of cognitive science or, more specifically, cognitive psychology. The word cognition comes from the Latin word for “to know,” and cognition refers to “behind-the-scenes” behaviors like perceiving, attending, remembering, thinking, and decision making. In cognitive psychology, we typically examine mental operations, or behaviors occurring inside our heads. Cognitive psychology examines processes we engage in every day without stopping to reflect on the complex series of behaviors that determine our success or failure. For example, have you ever talked on a cell phone while driving a car? Many complex cognitive operations are involved in both of these activities (and there’s plenty of research demonstrating it’s dangerous to attempt both at once!). Another example: You meet someone at a party and later you remember details about your new friend — where they live, where they work, and so on — but you struggle to remember their name. 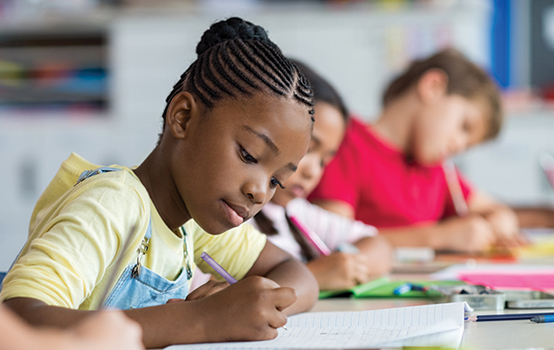 Strategies informed by cognitive psychology can help you remember names, concepts, and much more, and they have powerful roles to play in the classroom, too. In contrast to cognitive psychology, research on social-emotional learning (e.g., growth mind-sets and character development) investigates how we interact with the world around us; in other words, what happens outside our heads. This field comprises social and personality psychology, and social psychologists examine behaviors such as how we develop relationships, how we’re affected by culture, and why we form stereotypes. Of course, the distinction is a bit artificial because influences from the environment (such as stereotypes) are carried in our heads and so also depend on cognition. In other words, cognition affects how we behave in the outside world, and the environment around us affects the behaviors inside our heads. What did we used to think about learning, and what have we discovered? Some old ideas about learning die hard. Consider, for example, the notion that memory can be improved with practice. That is, if students practice memorizing poetry, say, they will become better at memorization in general and will be able to apply that skill to other subject matter. Even today, some teachers remain convinced that this is an important thing for students to do (Roediger, 2013). But while it is tempting to imagine that exercising one’s memory will strengthen it, as though memory were a muscle, that theory has been disproved time and again. Or consider the enduring but flawed theory that scientists refer to as “errorless learning,” the idea, popularized in the 1950s, that learning is most effective if students are prevented from making errors. Even today, many of us cringe when we see students struggling with a new concept or skill, and we might have the knee-jerk desire to step in and correct them before they stumble. Yet cognitive psychology has shown that because we learn from our mistakes, errors are in fact good for learning (Hays et al., 2013). More than 100 years of research, from both laboratory and classroom settings, have revealed a number of powerful strategies for teaching and learning. Of course, while educators today know much more about learning than they did in previous generations, and while scientific evidence has dismissed many old myths, other myths (such as the myth that children have specific learning styles) will likely remain in circulation for a while yet (Willingham, 2018). But although we still have a long way to go when it comes to ensuring that educators understand scientific findings and can translate them to everyday classroom practice, findings from cognitive psychology hold a lot of promise. More than 100 years of research, from both laboratory and classroom settings, have revealed a number of powerful strategies for teaching and learning. Retrieval practice boosts learning by pulling information out of students’ heads (by responding to a brief writing prompt, for example), rather than cramming information into their heads (by lecturing at students, for example). In the classroom, retrieval practice can take many forms, including a quick no-stakes quiz. When students are asked to retrieve new information, they don’t just show what they know, they solidify and expand it. Feedback boosts learning by revealing to students what they know and what they don’t know. At the same time, this increases students’ metacognition — their understanding about their own learning progress. Spaced practice boosts learning by spreading lessons and retrieval opportunities out over time so that new knowledge and skills are not crammed in all at once. By returning to content every so often, students’ knowledge has time to be consolidated and then refreshed. Interleaving — or practicing a mix of skills (such as doing addition, subtraction, multiplication, and division problems all in one sitting) — boosts learning by encouraging connections between and discrimination among closely related topics. Interleaving sometimes slows students’ initial learning of a concept, but it leads to greater retention and learning over time. choice quizzes), and complete a final exam immediately or after a delay (e.g., ranging from minutes to hours or days). Consistently, researchers see a dramatic increase in both short-term and long-term learning (Adesope et al., 2017). Similarly, research we conducted in several K-12 classrooms demonstrated that these four strategies led to consistent and reliable increases in students’ grades, confidence, and engagement (Agarwal et al., 2014). Further, we found these strategies to have strong potential to boost learning for diverse students, grade levels, and subject areas (e.g., STEM, social studies, language arts, fine arts, and foreign languages). And other researchers have demonstrated that these strategies improve not just the learning of basic factual knowledge, but also skill learning (including CPR resuscitation) and critical thinking (such as applying knowledge in new situations) (McDaniel, et al., 2013). In one of our studies (Roediger et al., 2011), students in a 6th-grade social studies class were given three brief, low-stakes quizzes, using clicker remotes (wireless devices) to answer questions. Following a lesson on Ancient Egypt, for example, they were asked to click through a set of questions about the material. Notably, the quizzes touched on only half of information that had been presented. Later, when we gave them an end-of-unit assessment, their performance was significantly better on the material that had been covered in the clicker quizzes than the material that wasn’t (94% vs. 81%) — i.e., just by completing a quick end-of-class quiz on that material, students had improved their memory and understanding of it. 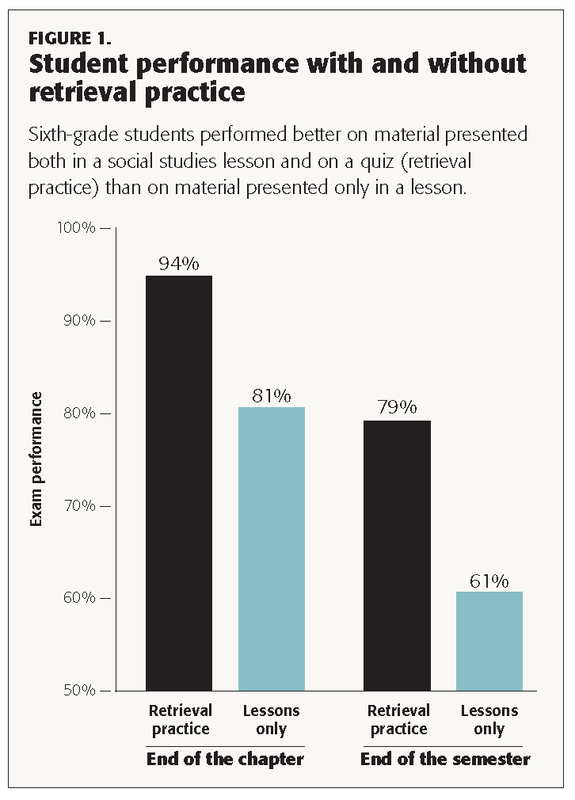 Even a couple of months later, at the end of the semester, students performed significantly better on the material that had been included in the quizzes, scoring an entire letter grade higher on that portion of the assessment than on the non-quizzed material (79% vs. 61%) (see Figure 1). Many teachers already implement these strategies in one form or another. But they may be able to get much more powerful results with a few small tweaks. For example, we often observe teachers using think-pair-share activities in their classrooms — typically, they will give students a few minutes on their own to think about a topic or prompt, then a few more minutes to discuss it with a partner, and then a chance to share their ideas as part of a larger class discussion. But what, exactly, are students doing during the think stage? They could easily be daydreaming, or wondering what to eat for lunch, rather than actively considering the prompt. But if the teacher simply asks them to write down a quick response, rather than just think, it becomes an opportunity for retrieval practice, ensuring that students are drawing an idea out of their heads and onto the paper. Similarly, rather than assigning students to consider a new topic, the teacher might ask them to do a think-pair-share about content they learned the day or week before — and now it becomes an opportunity for spaced practice; students get to return to material and solidify their understanding of it. Here’s another example: We often observe teachers begin their classes by saying something to the effect of, “Here’s what we did yesterday. . . .” and then reviewing the content. Instead, they can pose it as a question, “What did we do yesterday?” and give students a minute to write down what they remember. It’s a subtle shift (from a lecture by the teacher to an opportunity for retrieval practice), but it can significantly improve student learning, without requiring additional preparation or classroom time. Even a single question, writing prompt, or quick no-stakes quiz can make a difference, encouraging students to pull information out of their heads rather than cramming it into them via lecturing or telling. Teachers can use these four strategies (retrieval practice, feedback-driven metacognition, spaced practice, and interleaving) with confidence because they are strongly backed by research both in laboratories and classrooms. The rigor of science gives us confidence that these strategies aren’t fads, and successful classroom implementation gives us confidence that they work in the real world, not just in the laboratory. What are some hesitations when putting this research into practice? These strategies only apply to memorization. Actually, a growing body of research demonstrates that simply encouraging students to retrieve what they know improves their ability to apply that knowledge, transfer it to new situations, and retain complex ideas in content areas ranging from Advanced Placement social studies to medical school. In one study, for example, college students learned about the structure of bat wings using retrieval practice. On a final test, students were better able to transfer their knowledge to questions about the structure of airplane wings (Butler, 2010). A wealth of both lab and classroom research has demonstrated that retrieval practice improves students’ learning beyond rote memorization. I have to spend more time prepping for class and/or more time grading. As we mentioned earlier, small changes in class (like swapping reviewing for retrieving) can make a large difference for student learning. Many teachers already use these strategies, and cognitive psychology research affirms that teachers should aim to increase the amount of retrieval, feedback, spacing, and interleaving in the classroom. In addition, because these strategies are most effective when they are no- or low-stakes, they don’t require any grading at all. When students respond to a quick writing prompt in class, for example, there’s no need to collect their paper — it’s simply a retrieval opportunity for learning, not for assessment. I can’t cover as much material. When it comes to the trade-off of time vs. content, think about it this way: If students remember more, you save time by reteaching less. If we want to make sure that time spent teaching is time spent learning, then using research-based strategies to boost learning at the outset will make a large difference for you in class and for your students outside of class: They won’t need to do so much cramming before an exam. What’s next for the science of learning? We know much more about learning than we did 100 years ago. But what does this mean for education at large? There are many next steps for fields within the science of learning, including cognitive psychology. First, we need to continue to demonstrate that these principles of learning apply for diverse students and diverse environments. Recent cognitive psychology research has taken place in urban and rural K-12 classrooms, as well as public and private colleges and universities. In addition, preliminary data demonstrate that brief in-class quizzes boost learning for students in special education (Agarwal et al., 2012) and that college students with lower working memory benefit more from retrieval practice than students with higher working memory (Agarwal et al., 2017). Even so, to truly push the science of learning from the laboratory to the classroom, more research needs to be conducted in partnership with teachers in diverse classrooms. Second, we need to know more about student motivation. Why are some students inspired and driven to learn in school whereas other students are less motivated (despite some being avid learners for hobbies or sports)? How can we encourage students who have little interest in learning? We’ve all encountered a few lucky students who find an inspiring teacher with whom they click, increasing their drive to learn. But as far as we can tell, motivation is a complex cognitive process, and there are likely to be no panaceas here, no tried-and-true strategies that always work. Frequent retrieval practice (e.g., weekly mini-quizzes) can improve student engagement and student study habits, and instilling a growth mind-set may help some students, too (Dweck, 2006). Even so, we suspect that motivation is likely to be the next frontier in the science of learning, which will require collective efforts by developmental, social, and cognitive psychologists. Lastly, we need to get knowledge about effective learning strategies (ones shown to work in both lab experiments and classroom studies) into the hands of teachers and learners. Today, a number of books, websites, and resources provide accurate information and helpful advice for both educators and students. (See, for example, retrievalpractice.org and learningscientists.org.) However, we have much more to do on this score. Research from cognitive psychology has powerful implications for learning, and the best way to make an impact is by disseminating and sharing this research with fellow educators. We hope you will join us in this effort as we continue to explore learning — and the science behind it. Adesope, O.O., Trevisan, D.A., & Sundararajan, N. (2017). Rethinking the use of tests: A meta-analysis of practice testing. Review of Educational Research, 87, 659-701. Agarwal, P.K. (in press). Retrieval practice and Bloom’s taxonomy: Do students need fact knowledge before higher order learning? Journal of Educational Psychology. Agarwal, P.K., D’Antonio, L., Roediger, H.L., McDermott, K.B., & McDaniel, M.A. (2014). Classroom-based programs of retrieval practice reduce middle school and high school students’ test anxiety. Journal of Applied Research in Memory and Cognition, 3, 131-139. Agarwal, P.K., Finley, J.R., Rose, N.S., & Roediger, H.L. (2017). Benefits from retrieval practice are greater for students with lower working memory capacity. Memory, 25, 764-771. Butler, A.C. (2010). Repeated testing produces superior transfer of learning relative to repeated studying. Journal of Experimental Psychology: Learning, Memory, and Cognition, 36, 1118-1133. Dunlosky, J., Rawson, K.A., Marsh, E.J., Nathan, M.J., & Willingham, D.T. (2013). Improving students’ learning with effective learning techniques: Promising directions from cognitive and educational psychology. Psychological Science in the Public Interest, 14, 4-58. Dweck, C.S. (2006). Mindset: The new psychology of success. New York, NY: Penguin Random House. Hays, M.J., Kornell, N., & Bjork, R.A. (2013). When and why a failed test potentiates the effectiveness of subsequent study. Journal of Experimental Psychology: Learning, Memory, and Cognition, 39, 290-296. McDaniel, M.A., Thomas, R.C., Agarwal, P.K., McDermott, K.B., & Roediger, H.L. (2013). Quizzing in middle-school science: Successful transfer performance on classroom exams. Applied Cognitive Psychology, 27, 360-372. Putnam, A.L., Sungkhasettee, V.W., & Roediger, H.L. (2016). Optimizing learning in college: Tips from cognitive psychology. Perspectives on Psychological Science, 11, 652-660. Roediger, H.L. (2013). Applying cognitive psychology to education: Translational educational science. Psychological Science in the Public Interest, 14, 1-3. Willingham, D.T. (2018, Summer). Does tailoring instruction to “learning styles” help students learn? American Educator. Citation: Agarwal, P.K. & Roediger, H.L. (2018). Lessons for learning: How cognitive psychology informs classroom practice. Phi Delta Kappan, 100 (4), 8-12. POOJA K. AGARWAL (pooja@poojaagarwal.com) is an assistant professor at the Berklee College of Music in Boston, an adjunct professor at Vanderbilt University in Nashville, and founder of RetrievalPractice.org, a hub of resources for teachers based on the science of learning. Her upcoming book, coauthored with Patrice M. Bain, a veteran K-12 teacher, is Powerful Teaching, Unleash the Science of Learning (Jossey-Bass, Spring 2019). HENRY L. ROEDIGER, III (roediger@wustl.edu) is the James S. McDonnell Distinguished University Professor at Washington University in St. Louis. His most recent book, coauthored with Peter Brown and Mark McDaniel, is Make it Stick: The Science of Successful Learning (Harvard University Press, 2014). Got it wrong? Think again. And again.